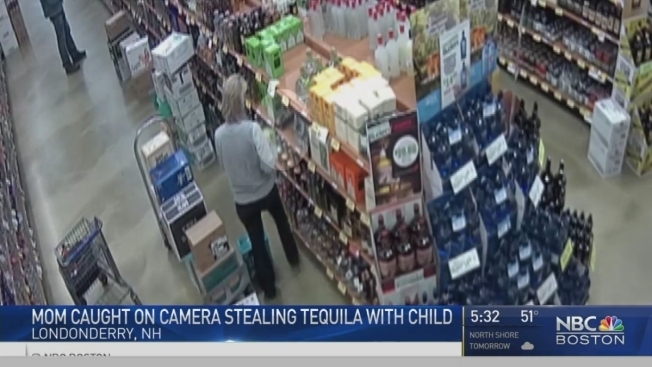 Police in Londonderry, New Hampshire are looking for a woman caught on camera stealing liquor with a young child by her side. Camera video shows a woman stealing one bottle of tequila. Police in Londonderry, New Hampshire are looking for a woman caught on camera stealing liquor with a young child by her side. The store's surveillance video shows a woman stealing one bottle of tequila. Londonderry Police Detective Chris Olson says after a store clerk found an empty tequila box, they went back and reviewed surveillance tapes. “It’s unfortunate, it’s disheartening when you see a child involved in these things,” Olson said. He says the video shows that woman slipping the liquor into her purse, paying for a different bottle at the front counter, and then walking out with the stolen item over her shoulder and the child on her hip. Some people would like to give her the benefit of the doubt, like Derry resident Amaya Perez. “If she needed something for the baby, maybe I would understand but it’s not like you need that alcohol,” Perez said. “There is no morality; there is none,” Walszac said. “No I don’t feel bad for her one bit." If you recognize the woman in the video you are asked to contact Londonderry Police.